Barcelona - I love you. The sun is rising at 7am ish (not that I've seen it to prove it) and setting at 9pm. The days are long, warm and delicious stretching out with invitations to enjoy. We are becoming more and more European each day with lazy starts and late late nights. We relaxed this morning, Changing our plans for the future. An airbnb at the next town of Valencia had changed its offering from two beds to one (extra bed at cost) and that triggered us to stay here in Barcelona one more night. I am loving this city. So we added a day here, put off the car hire, booked the earliest entrance tickets we could (7pm) to Sangred Familia (with the same bizarre ticketing system as the Guell gardens) and Joel had some flights to change as he is going back to work earlier than expected. I slipped across the road for coffee (apologising profusely for the non-European use of hot milk) and with senor's help chose mini baguettes, crusts crispy and tasty but inside soft filled with shaved meats and cheeses and several croissants like I have never had before, filled with chocolate or custard. "This one is not too heavy, just light ... You will like it, and come back to me" he says with his delightful Spanish accent. You bet I will! Fact is I am planning on living here FOREVER! We ate in our room and then plunged out into the day. When you leave the cool quiet air conditioned hotel and step outside into the street the warmth and the bustle of the city is a shock of joy. Excitement for what is coming. It's on to the scooter and we ride for a while, I love being on the bike, and after a last run along the seaside return the bike to the hire place. Then we walk back via the gothic quarter - this is the heart of the old city. Many of these building date from the medieval times, even as far back as the Roman settlement in Barcelona. It's labyrinthine and we go left, right left choosing our way based on nothing else but guess work. I love doors and windows and they are so good here. Graffiti art on some, huge locks and wrought iron bars and decorative iron work. Some are enormous and some tiny. Lunch has been stopping at places to buy small treats, sharing another baguette, a cup of gelato, lots of water, a sit in a tiny, flower filled bar with salmon Pintxos, flavour bursting oil drenched olives and drink something delicious recommend by the owner. 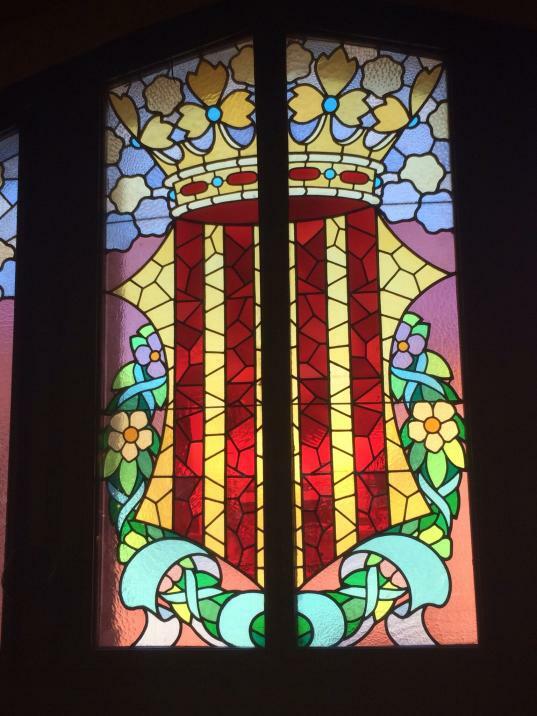 We find the Palau de la Música Catalana -and with a tour going through learn the history of this extraordinary place that is filled with natural light via overhead and side coloured glass, and is the home of music in this city. It's stage, timber, ornate statues, stone horses plunging from the ceiling, and again ground breaking in the early 1900's construction industries. It fill your soul with colour and beauty these places. Joel commented how people made so much beauty in places that rarely get seen. The outside walls, way up high and hard to see covered with beautiful mosaics. And we compared it to Australia 's comparatively functional and ecconomical designs. And it's not like this has just happened. Construction of this UNESCO world heritage listed church began March 19, 1882 and it recently opened to the public in late 2010. BUT it's still nowhere near finished. (The Spanish civil war did stop it for a while) Cranes are part of its skyline and construction work is visible all over it. They are hoping to finish it by 2026. Makes my house renovation - lasting a year - really super fast. Antino Gaudi was the architect and he took most of his inspiration from nature- he dreamed of the cathedral to like being in a forest - and many of the elements of his design has come from his observations of the world around him. Trees, leaves, honeycomb, minerals, wings, he looked at God's creation and converted the same principles into stone, bricks, mortar, structures. He broke conventions and what people thought could be done. He now lies in a crypt in the depths of this place, guarded by red flickering candles, statues, ornate light fittings and the faces of people paying respects to a man who didn't let what was known to get in the way of what could be. It's less then 3 km away so we walk there, stopping only to buy peaches and yellow plums, sweet plump and juicy to eat as we go. We arrive for our entrance time (locked in at 18,45 to 19.00) and it's easy entry with smart phones and scanners. The tickets are restricted to 300-400 hundred every 15 mins but you can stay for as long as you like. I don't think I can do justice to the next few hours with words or photos. From beginning to end it was breathtakingly jaw dropping. The outside, despite the building works is a mass of legendary figures, animals, nature and spires, towers, every part covered with ornate decoration. Over the top in crazy joy. Everything is symbolic, the number of elements, the placement of figures, there is a reason and meaning to everything you see. And you walk inside, past the doors (oh the glorious doors) into the astounding forest of pillars reaching up 75 m.
You look up and up and up. And through, like a forest, through the enormous truck like pillars which hold the faraway ceiling of beauty. And the walls have enormous stained glass windows, each in a colour tonal range. And when we arrived the golden yellows and Reds were lighting up, glowing bright reflecting on the stone. The Blues and greens on the opposite side incredible in their depth of colour. And even the crowds of people did not diminish it. It was built with people in mind, to be filled with people. Albeit I suspect worshiping God not taking photos and shaking their heads with wonder at the architecture ! We explored underneath and around, watched old Spanish ladies at the feet of Virgin Mary intoning prayers. And sat for a while on seats my aching feet on cool marble floors. Seafood paella for dinner, as you can do in Spain and Joel, full of navigational knowledge (smart phone king) gets us onto the next bus home. I sit on the bed and briefly admire a particularly large blister and he goes out and meets with friends. Going to sleep with so much beauty filling my mind. Usually it's the daily business things, the home things, the groceries and cleaning and the life of normality that I think of. It's a holiday for my spirit too, seeing so much inspiring beauty. And sharing it with one of my children, enjoying his company, seeing the confident able man he has turned into is mum-heart warming.